This is a Tour for everybody, kids from 12 years old. Minimun fitness level required. We will ride along part of the promenade until we reach the lighthouse, to after head off to the hidden secret of Playa Blanca known as “Los Charcones”, the amazing natural pools located on the west coast, where you can find one of the nicest sunsets in the island. We will also pass by the misterious “abandoned hotel” and have a little break to eat the fruit and take some pictures. And, if the weather is good, you can jump in the water for a quick dip! 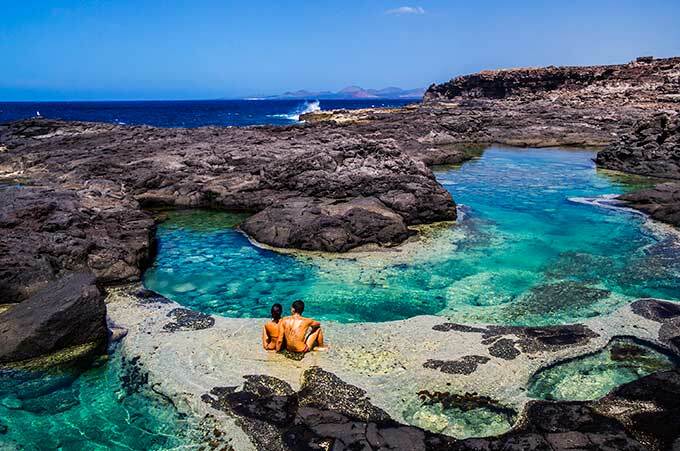 Enjoy Lanzarote’s unforgettable views on this 10km-15km Natural Park tour. You will explore stunning volcanic landscapes, wild trails and some of the best white beaches Lanzarote has to offer. Riding along the sea shore and rocky hills is easy and effortless with these light-weight bikes thanks to their amazing grip and stability. Rediscover the child within in the wilderness of this beautiful island, it’s a whole new bike experience you can’t miss. With FAT BIKES, fun is guaranteed! If you are a regular rider, with good technical skills and want a little bit more action, then this is your Tour. The tour goes through the beaches of Papagayo and its most challenging and exciting trails. After visiting the natural park we will ride to the other side of town and go up the volcan Montaña Roja to enjoy the spectacular panoramic view over Playa Blanca and the neighbour island, Fuerteventura, from the edge of the crater.